Phillip Webb has sent me another photo of the last days of the Little Streets. The vantage point is from a balcony of one of the then new flats. 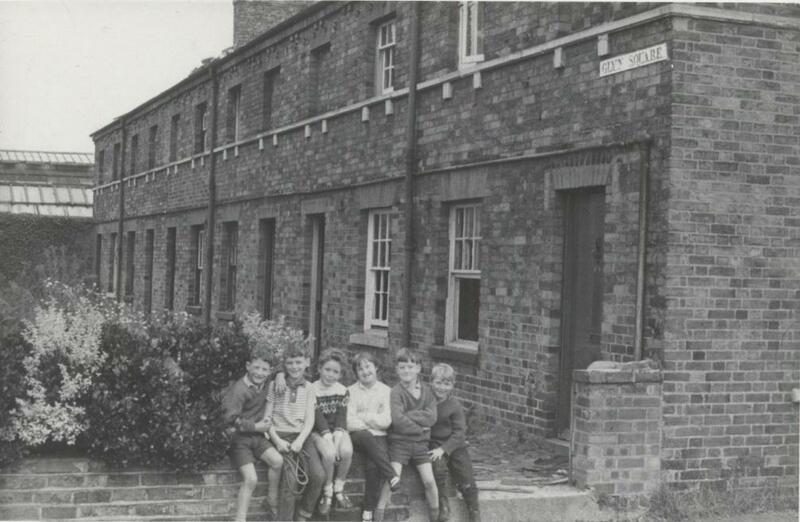 At the time of this photo much of the east side of Ledsam Street and Young Street has been taken down, leaving that short row on the west side of Ledsam Street. Demolition is just starting. 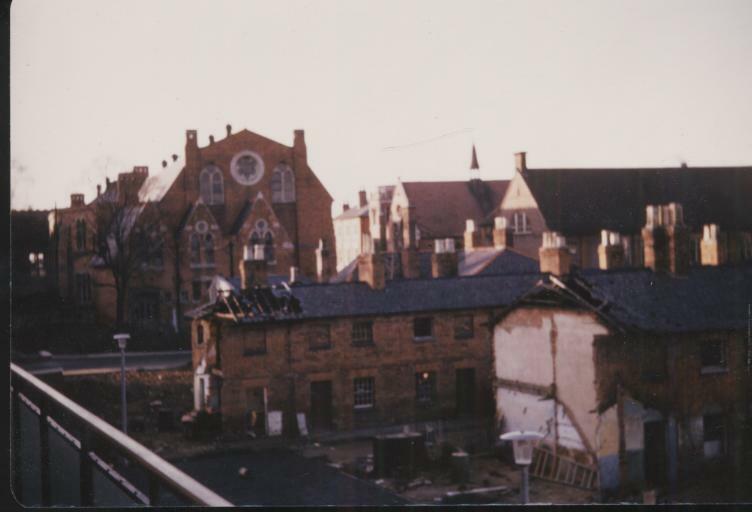 You can also see the roofs of some of the Creed Street shops. The Science and Art Institute stands proud in its former splendour. Here’s a unique photograph of part of Glyn Square. the square originally had houses on three sides. There were two terraces of 6 on the north and south side and a terrace of 20 on the west side – behind the photographer in this photo. The picture shows the south terrace. The north terrace was pulled down in the 1890s for works expansion and at about the same time these cottages were enlarged to allow for a third bedroom. The photo was unearthed by Phillip Webb. 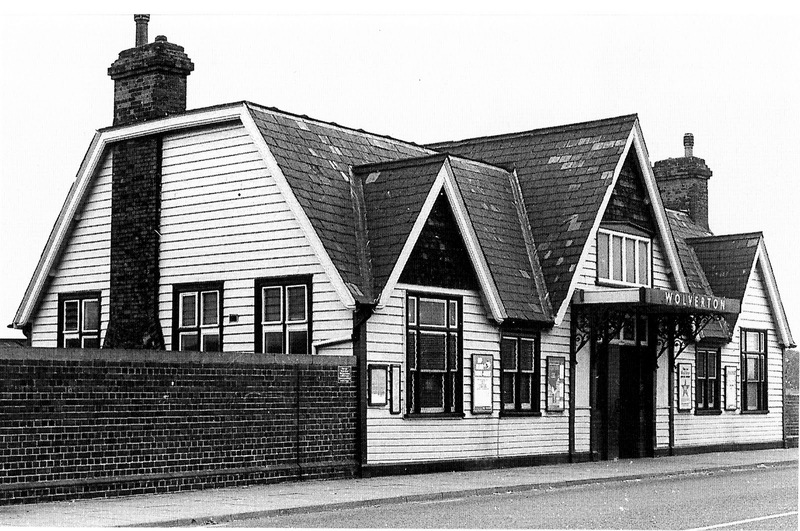 Wolverton is now on its fourth set of station buildings, although the site and the platforms remain as they have done since 1881. 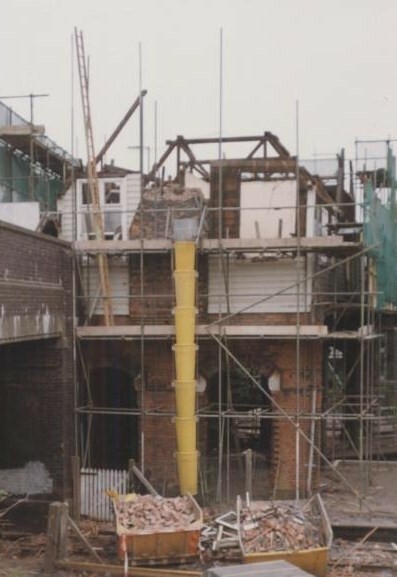 Phillip Webb has just sent me these two photos which show the third station buildings in the process of demolition in 1990. The first photo shows the Booking Hall, mounted on piers, and the second one of the covered flights of stairs which led down to the platforms. My post on the third station can be found here. And if you want to go back to the second and first stations, click on the links. By 1860 the northern streets have been removed, as have the Bury Street shops. This was the decade of the McConnell Engines. The watercolour below is by Phillip Webb. The Works were the whole reason for Wolverton’s being so I’m going to run a series of posts about the development of the works. Phillip Webb, who is working on a history of the Works development and decline has shared some of his watercolours with me and I will post these over the next few blogs. The first engine shed was completed in 1838, in time for the opening of the line from London to Birmingham. It was basically a square and occupied most of the land the Company had acquired. The painting below by Phillip Webb shows the same building in more recent times. The roof has changed and the building no longer used for its original purpose.